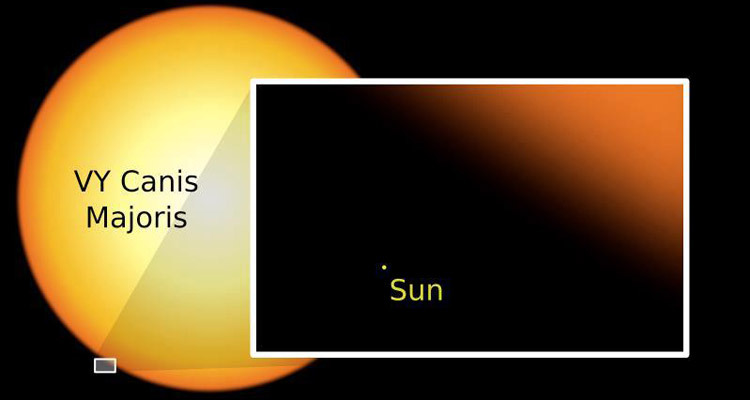 VY Canis Majoris is about 1,000 times wider than the Sun, making it one of the largest stars known. VY Canis Majoris. Material ejected by the star is visible in this 2004 image captured by the Hubble Space Telescope's Advanced Camera for Surveys, using polarizing filters. Credit: NASA/ESA/R Humphreys/U Minnesota). Jets of molecules, indicated by red and blue arrows, flow from VY Canis Majoris photographed by the Hubble Space Telescope. The blue arrow (lower right) shows the slight deviation of the "squirt" flow from the direction towards us. 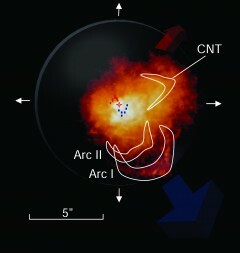 The curved nebulous tail (CNT) and red arrow (upper right) show the fan of material flowing away from us and to the side. The white arrows and transparent circle show the general spherical flow of matter outward. Credit: UA Steward Observatory. VY Canis Majoris is a red hypergiant star that is one of the largest and most luminous known stars in the Milky Way Galaxy. It is an irregular pulsating variable, lies about 5,000 light-years away in the constellation Canis Major. Although VY Can is about half a million times as luminous as the Sun, much of its visible light is absorbed by a large, asymmetric cloud of dust particles that has been ejected from the star in various outbursts over the past 1,000 years or so. The infrared emission from this dust cloud makes VY Can one of the brightest objects in the sky at wavelengths of 5–20 microns. In 2007, a team of astronomers using the 10-meter radio dish on Mount Graham, in Arizona, found that VY Can's extended circumstellar cloud is a prolific molecule-making factory. Among the radio emissions identified were those of hydrogen cyanide (HCN), silicon monoxide (SiO), sodium chloride (NaCl) and a molecule, phosphorus nitride (PN), in which a phosphorus atom and a nitrogen atom are bound together. Phosphorus-bearing molecules are of particular interest to astrobiologists because phosphorus is relatively rare in the universe, yet it is a key ingredient in molecules that are central to life as we know it, including the nuclei acids DNA and RNA and the energy-storage molecule, ATP. 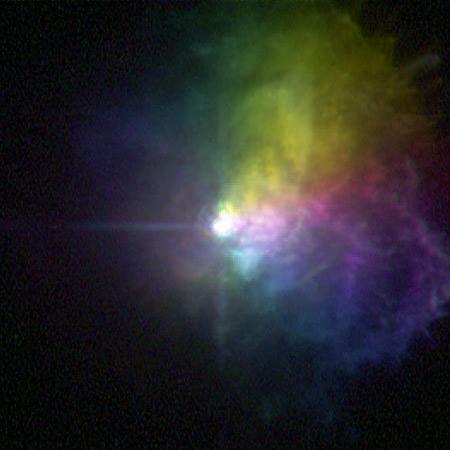 Among the first results of the Herschel Space Observatory, in November 2009, was a detailed spectrum of the cloud of gas swirling away from VY Canis Majoris obtained by the SPIRE instrument. This revealed copious amounts of water and carbon monoxide together with the spectral signatures of more than 30 other molecules (see below).